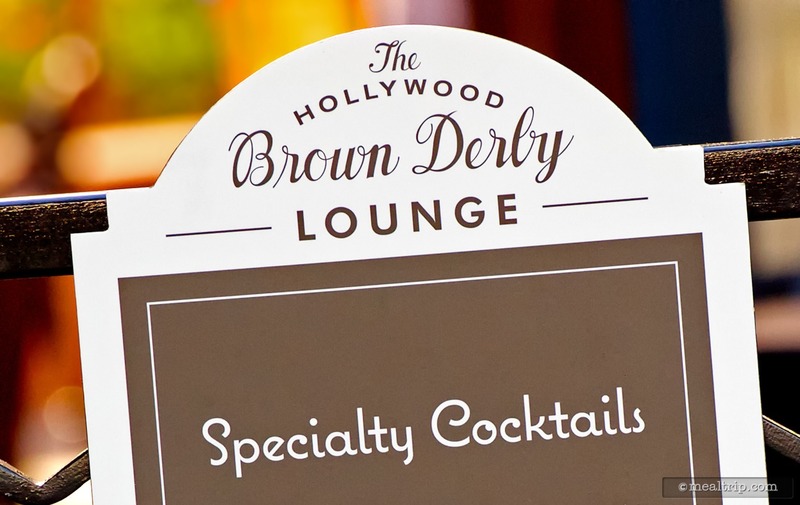 The Hollywood Brown Derby Lounge is small area that is a half outdoor, umbrella covered patio, and half indoor table and chair, (but still open air) lounge that is located in the shadows of it's namesake, the larger Hollywood Brown Derby. Seating is on a first come first serve basis, and is intended to be an area where one could grab a quick upscale snack. There's a very visible full bar at the entrance, and a "small plates" menu that include a couple of cheese boards, sliders, mussels, duck tacos, and a few desserts. If the menu at the larger Brown Derby is any indication though, the offerings may change from time to time depending on what dishes are seasonally trending. The "small plates dining" concept at the Brown Derby Lounge is a fairly new idea for the Disney parks, and we've seen a few other locations (such as the Spice Road at Epcot) give the format a try. I won't get into what "Tapas" style dining is, but at it's origins (in Spain), "going for tapas" would involve going to several different locations, and getting small food and drink samples at each location. With there being only one such location at Hollywood studios, I think we'll have to continue calling it "small plates dining". There are a myriad of great looking beverage flights on the menu, and while I won't get into those in this review there are Margarita fights, wine flights, a champagne flight and even a scotch flight, but sadly... no beer flights. In fact, there are only a few rather common domestic beers offered at all in the "Lounge", with such "exotics" as Stella Artois being available only in the larger, main Brown Derby Restaurant. Odd, but according to my waitress, true. On to the real highlight at the Brown Derby Lounge, the food. Fortunately, small plates doesn't mean small flavor or necessarily simple food. Everything sampled on this particular visit was fresh, well composed, and well executed with contrasts in flavor and texture present in everything ordered. 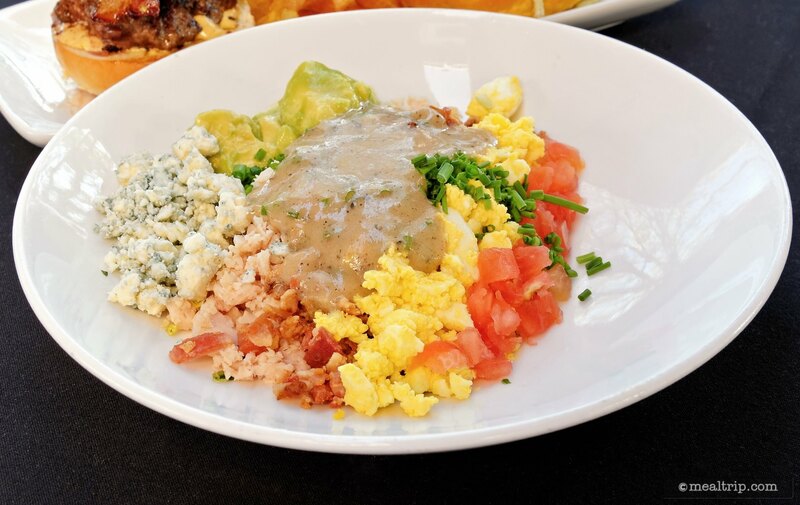 I began with the Brown Derby iconic Cobb Salad just to see if it was the same as what is being offered inside the main restaurant. While it is a smaller portion, made for one, rather than being large enough for the table to sample, the ingredients and balance was the same. All of the finely chopped components are presented separated in one plate for you to toss yourself. The balance of the components was spot on and the Cobb was delicious. About the only thing I would change, (and this is more personal preference than anything) is to include the avocado as a more chopped, solid product and not quite so "guacamole-like". Things can get pasty quick with avocado in a too puréed form along with the other components of the salad. Next up, the Derby Sliders. I could just eat these all day, (especially if I could get a decent beer, but I digress). There are two sliders on the plate with a few house-made chips (which are pretty decent as well)… a Wagyu Beef Slider with cognac-mustered aioli, gouda, bacon, and that avocado paste again (I just can't get away from the avocado paste). 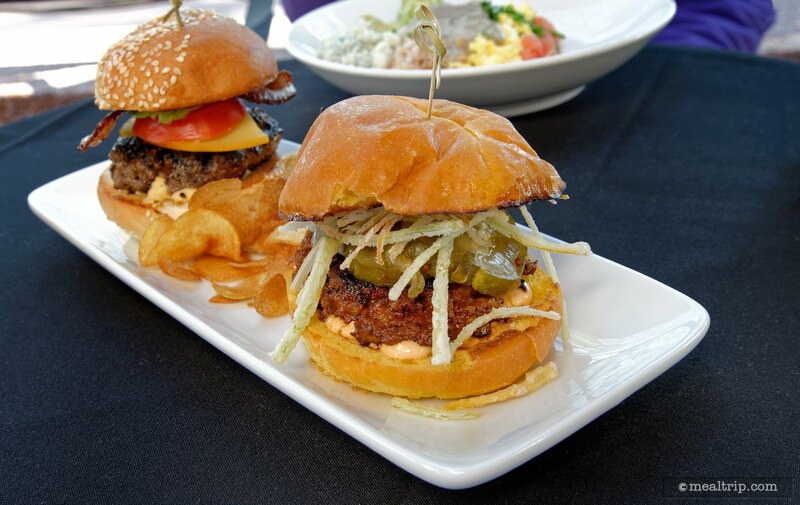 The second slider is a house-made chorizo patty with chipotle mayo, manchego cheese, pickles and crispy onions. There is a great balance between the two with the Wagyu beef slider being just about the best backyard, summertime burger you would ever hope to get and the Chorizo slider proving a bit of a kick, without being so overbearing that it kills your palate. 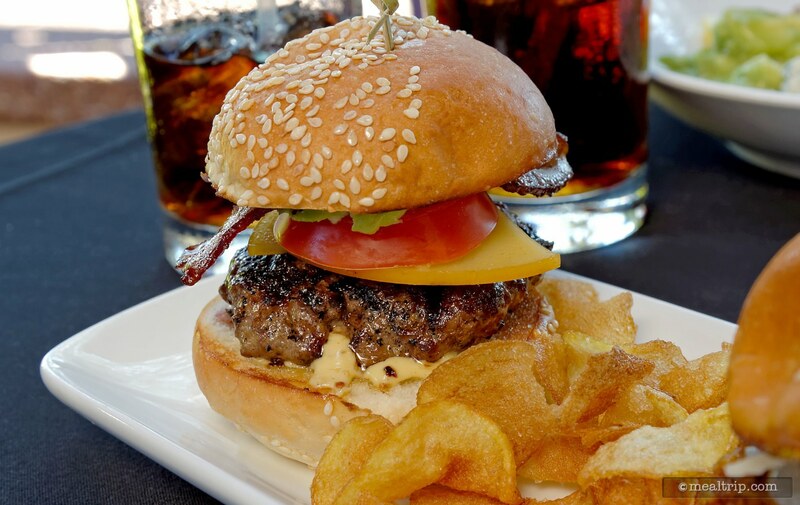 Every component in the Wagyu slider can be tasted, from the crispy bacon to the slightly smokey, smooth gouda, and the traditional sesame seed cheeseburger bun doesn't get in the way or provide "too much bread" as can happen with lesser sliders. The delicate grilled brioche bun that carries the Chorizo slider's components is no slouch either and lets the crisp freshness of the pickles contrast against the slight kick of the chorizo and chipotle mayo. The "crispy onions" mentioned are more for mouth-feel and visual appeal, than they are for flavor... but I can't say that's a bad thing. Too strong of an onion would push the whole slider into a different direction. It's great just the way it is. 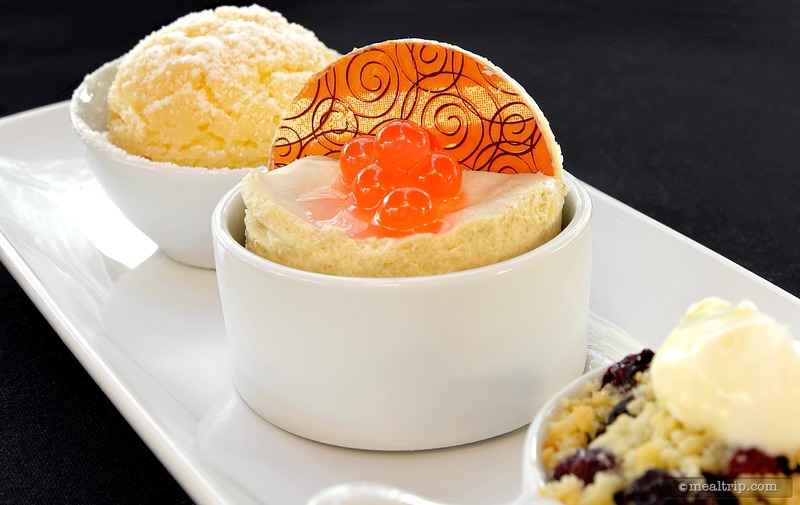 The Brown Derby (Main room and lounge) feature a collection of nine mini-dessert, of which, you can select three... much like a dessert flight. I'm not really a fan of the new mini-dessert trend, but I must say, these were the best I've found so far on Disney property... and mostly because of their complexity. It's far too easy to toss pudding in a cup and call it a day, but the Brown Derby lounge mini-desserts (that I selected anyway) all had at least two prepared components in them, and were quite good. 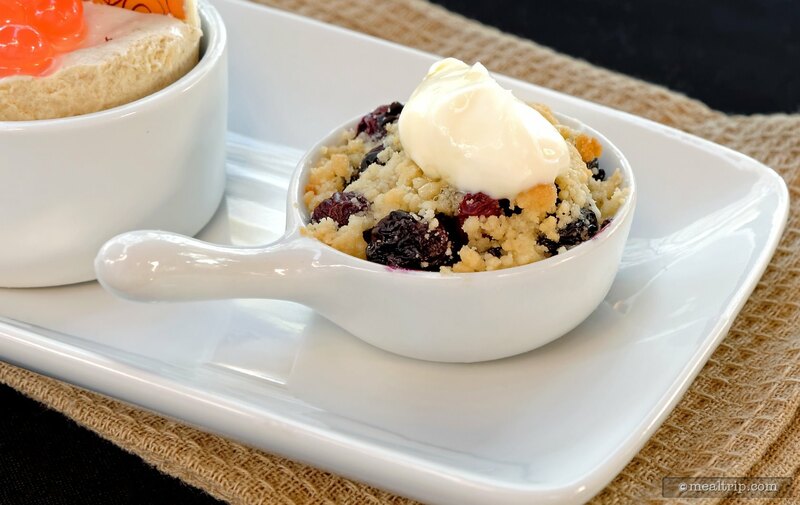 The warm blueberry cobbler had a great, fresh flavor and was the one mini-dessert you wish there was a little more of. The orange blossom honey that ran throughout… was very subtle. 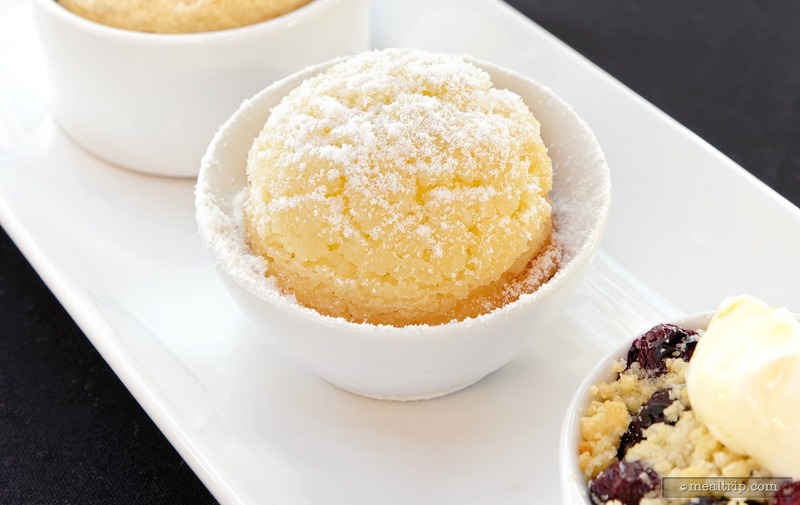 What the "crunchy sugar cookie puff" lacked in crunch, it made up for in lemon grass cream... it was quite herbal and didn't have that "fake" lemon tone that so many lemon dessert fall victim to. And lastly the banana toffee cake, had the most subtle mix of flavors, it surprisingly, was the one that you wished had a bit more punch to it. The strawberry pearls that were on top of the banana toffee cake were very, very cool. They were like little bath beads full of punchy strawberry liquid... and now, I want them on all desserts. Little bourbon beads for my pecan pie, little cherry cordial beads for my chocolate lava cake... I could go on all day! 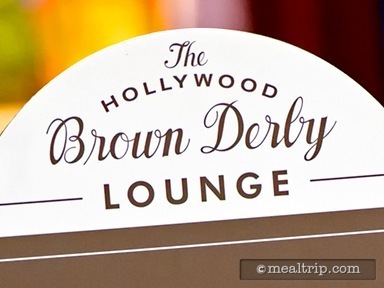 Unfortunately, all was not perfect at the Brown Derby Lounge. 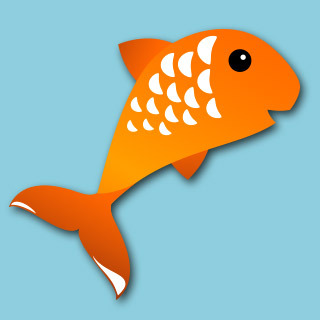 You may be wondering about my "one star" for the Environment and "n/a" as the Value score. Well you see, the Brown Derby Lounge is an outdoor dining area. They have these comfortable vinyl covered seat cushions that look dry on the outside, but retain tons of water on their spongy insides. It's not apparent at first, but at some point during my relaxing visit, I began feeling a very unsettling wetness. Upon standing up, my dining mate and myself were quite soaked with rainwater that had collected on the inside of the cushions... drawn out by our own weight over the course of our stay. Wet to the point that we had to leave the park and change. It's not something I would wish on any patron, at any restaurant, and especially not at a such a nice, moderately priced dining location. Which is why it's hard for me to leave a "Value" score. The food was great, but not good enough for me to enjoy sitting in a pool of day old rainwater, squeezed out of what I'm sure is the foulest form of petri dish one could find at any restaurant... the seat cushion. Here's hoping this isn't happening to everyone that visits the Brown Derby Lounge. If I return, I will look for a metal chair, or perhaps just sit on my napkin as sort of an "early warning detection system". The cobb salad was finely chopped. I did not care for the dressing. The sliders were delicious. Great beef quality. I enjoyed every bite. The three pick for desserts was fun and they were very tasty. What were those little berry toppings? Didn't want to share. Quite a surprise. Warning!! If you sit on a vinyl cushion, pick it up and look underneath. It had rained the day before and although the top of the cushion was dry, as you ate your meal, the rain water from the cushion soaks your seat. Very embarrasing and really ruined the experience. Needless to say I had to leave the park.